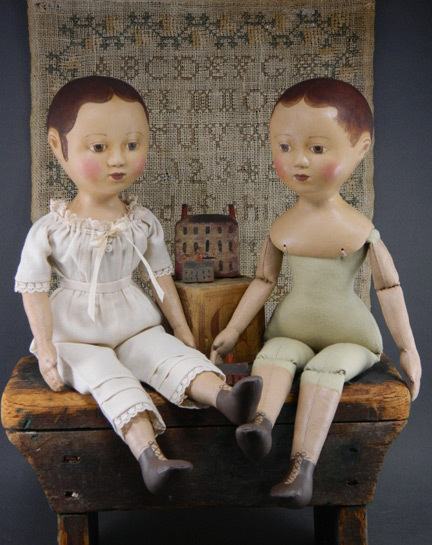 THE KITS: The dolls for this new kit have papier mache heads (all molded from my own originals) with easy to carve wooden limbs and cloth bodies. 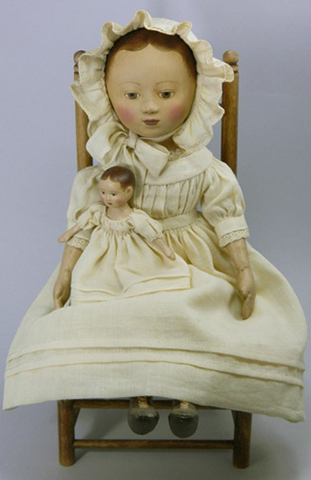 I think it is a moderately easy kit and the doll is a wonderful not-too-small scale. They will have the traditional blue bands securing limbs to bodies. 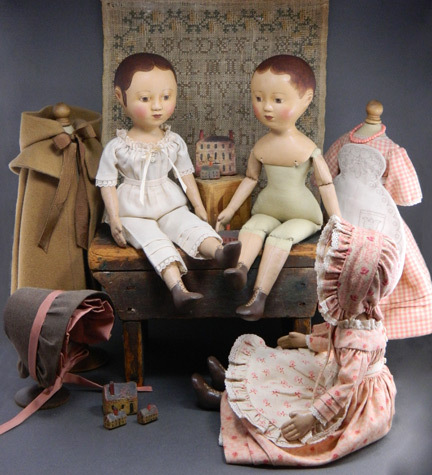 Kits will include parts for the dolls (head and wood arm leg and foot blanks), body fabric, wool stuffing, necessary paints to make the doll including a new paint to make cheeks easier, plus fabric & notioins for her lace trimmed undies and a special cheek brush for the best cheeks. 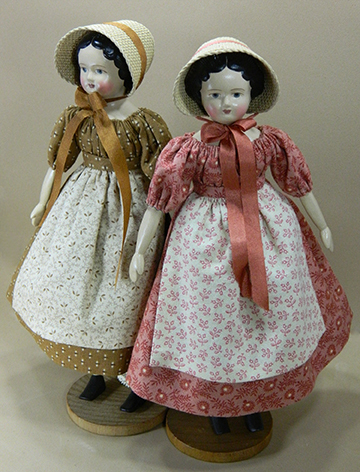 Patterns for two outfits (one is a simple period dress shown above right, the second is her fancy gown - not shown in picture) are included for you to use with your own choice of fabrics and trims. 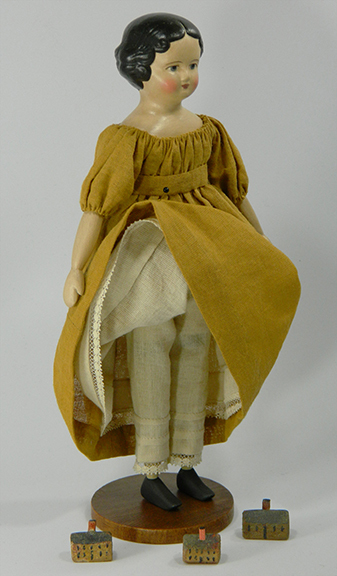 A 10" Izannah Walker Inspired Doll with Wardrobe ~ A fine addition to my doll kits and a wonderful doll to collect and sew for. This doll is a scaled down version who in her original size of 18" was sculpted by me carefully by measurements and shape templates from a real 21" Izannah, so she is pretty true (well, I do admit to making her more subtle ears than Izannah did). 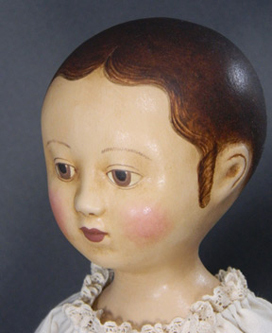 Her head is molded papier mache with a cloth body stuffed with wool. Included are special painting instructions for either wispy side curls or her signature sausage curls. 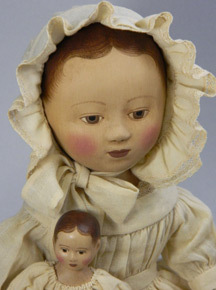 Although the painting is somewhat tricky, I have simplified the methods with the help of recommended special tools so that really is not that much more than any other painted doll. 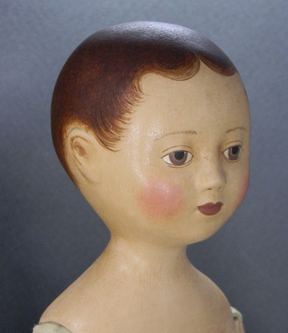 Of course, I also offer pre-painting of the head as I do with all my other molded dolls. 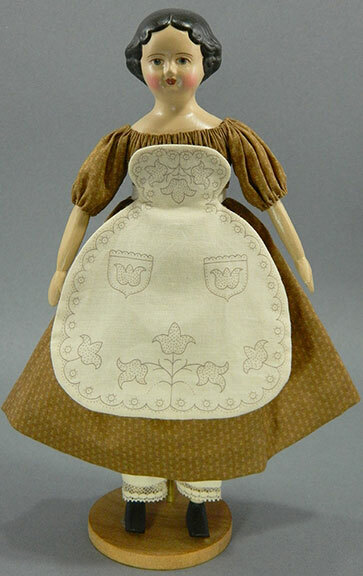 Her patterns for her wardrobe include her pantalets and camisole, petticoat, 2 dress styles, 2 aprons, her hooded cape, a hard constructed and a cloth bonnet plus her own folk cat (an accessory she is often depicted with) and a pocket. Included in the kit are also very special cotton knit and optional instructions for doing the knit-over technique if you choose. • Recommended Special tools (besides the ordinary ones needed) available on the Supplies pages: 1/8" Comb Brush, New Comb Brush Tool plus click here to see the pointy Q-tips and make-up brushes that will make your work easier. 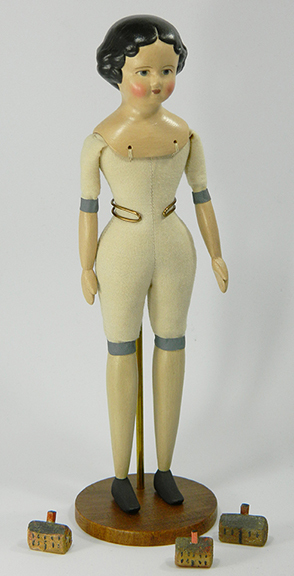 Below are other limited versions (now sold out) using this doll. 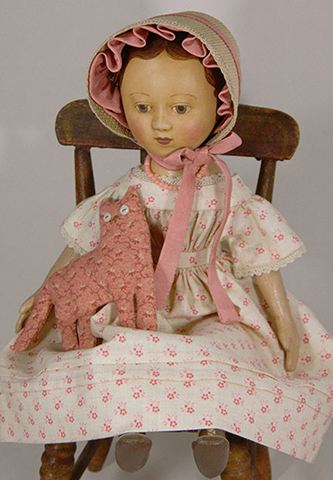 This is a Limited Edition of the 10" Izannah above all in perfect pinks with her Folk Cat and straw bonnet trimmed in silk. This edition is sold out and no longer available. This version has the 10" Izannah dressed in a delicate antiqued voile and lace outfit and making it extra special is her own tiny Izannah. This edition is sold out and no longer available. 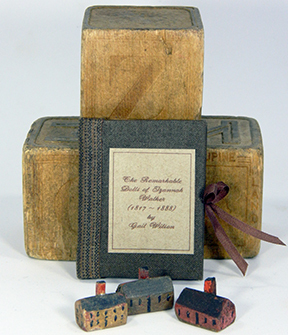 There is too much information for a doll tag about Izannah Walker and her remarkable dolls so I made a little hard bound book of this history in a size just right for most Izannah dolls (10" and up) to hold.